The Monterey Bay Aquarium is a science-driven organization, and rigorous science underpins all of our public policy, research and education programs. Much of our research centers on marine life that visitors can also see in our exhibits – from sea otters to sharks and tunas, even our giant kelp forest. Here’s some of what we’ve learned over the past 30-plus years that is contributing to conservation of key ocean species and ecosystems. Revolutionary female scientist Jane Goodall was the first person to discover that chimps use tools and live within complex social systems. Our team of female researchers are walking in Jane’s footsteps with their recent studies on use of tools by another mammal: the sea otter. When observing sea otters along the Monterey Peninsula, sometimes we can hear a “crack, crack, crack!” above the roar of the tide. That sound comes from sea otters using rocks and other tools to open prey items, such as crabs or bivalves, as they float on their backs. Sea otters are avid tool users, but until recently not much was known about how sea otters choose their tools, what aspects of their environments influence tool use, or whether they teach tool use to other otters. The Aquarium’s decades of research into sea otter behavior provided years of observations of sea otter foraging and tool-use behavior, including sea otter pups pounding empty fists against their chests. Could such activity be instinctual? Research Biologist Jessica Fujii has devoted much of her young career to studying the frequency and types of tools used and whether tool use can be coded in sea otter genes. Jessica is looking ahead to see how sea otters learn, teach, and eventually master tool use in the wild. Estuarine Research Reserve. 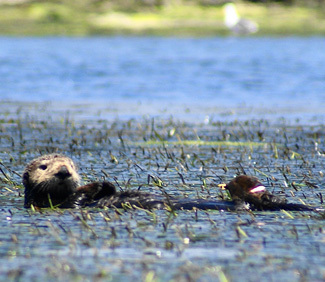 Sea otters contribute to the recovery of eelgrass and ecosystem health in this vital wetland on Monterey Bay. Photo by Ron Eby. With 15 years of experience rescuing, rehabilitating, and then releasing surrogate-reared sea otters into Elkhorn Slough, an estuary near Moss Landing, California, the sea otter research team at the Aquarium began to wonder how and if their work was affecting the otter population there. Does releasing a few animals into the slough each year really make any difference? After crunching some serious numbers from the surrogacy program and the U.S. Geological Survey’s (USGS) annual sea otter census, the researchers discovered that it did. Nearly 60 percent of the 140 or so sea otters living in Elkhorn Slough today are there as a result of the Aquarium’s surrogacy program. While we’d known that sea otters served as ecosystem engineers for the giant kelp forests in Monterey Bay, we have now documented that sea otters in Elkhorn Slough are restoring the health and biodiversity of the estuary. This gives us further insights into how sea otters may contribute to coastal ecosystem resilience. Scientists at the Tuna Research and Conservation Center (TRCC) – a collaboration between the Aquarium and Stanford University – study the physiology of highly migratory ocean predators such as Pacific bluefin tuna so that we can better understand how rising ocean temperatures associated with climate change might affect their migrations and habitat. Gathering information about these powerful predators in their ocean homes is challenging – almost like trying to chase a gazelle on the Serengeti. It would be nearly an impossible feat without advanced tagging and tracking technology. In one study, researchers surgically implanted archival tracking tags inside 144 tuna to measure heat generated as they digested their food. Based on previous studies performed in TRCC labs – and the location data revealed by the tags – the team was able to tell where in the California Current the tunas’ energy intake was highest and lowest over the span of a year. The team mapped a dynamic energy landscape that shows which parts of the ocean are most important to Pacific bluefin tuna for foraging and survival. The team’s findings offer valuable insights about these key ocean predators and their ability to respond to conditions in a changing ocean. From 1985 to 1991, our kelp forest ecology researchers studied kelp forest habitats around the Monterey Peninsula. Kelp grows prolifically thanks to abundant sunlight and rich oceanic nutrients, but much of this annual growth gets ripped out by winter storms. Masses of kelp pile up on beaches, or float out to sea. To better understand what happened to the kelp after it detaches, the team partnered with the Monterey Bay Aquarium Research Institute (MBARI) and used its tethered robot ROV Ventana to survey the Carmel Submarine Canyon. They found kelp deposits as much as 450m (1500 feet) below the surface. 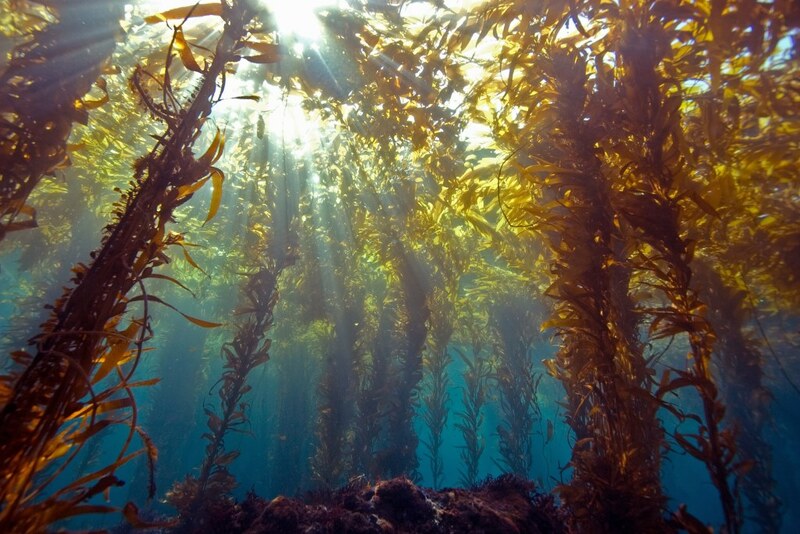 It turns out that large, floating kelp rafts from sunlit coastal waters eventually become a source of energy and habitat for deep-water marine communities. Such movements of marine algae were well-documented, but at the time of this study, the ecological importance of these deposits was only beginning to be understood. Our team estimated that kelp rafts can account for 20 percent to 83 percent of the total particulate organic material on the sea floor in the Carmel Submarine Canyon – a significant contribution of nutrients to deep-sea marine life. Between 2004 and 2009, Monterey Bay Aquarium worked with an extensive team of partners to collect and exhibit young white sharks – the first time such a feat was successfully accomplished. While the sharks were on exhibit, for periods up to six and a half months, the research team had the opportunity to learn more about the biology of this apex ocean predator in a controlled and scientific setting. The calories each shark consumed from daily seafood meals (of salmon, mackerel and sablefish) were carefully tracked to calculate the percentage of energy dedicated to metabolic functions such as waste production and growth. 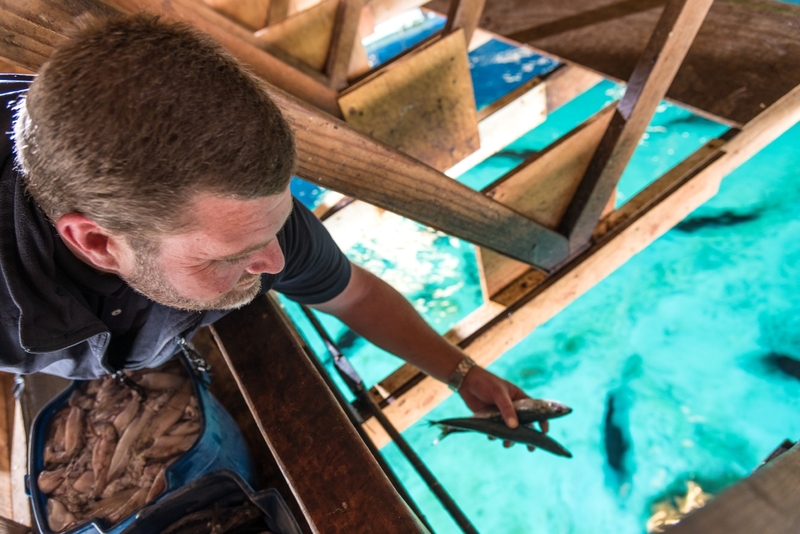 The team concluded that while in the optimal environment of the Aquarium, these young white sharks showed nearly twice the growth rate of previous estimates. In fact, the white sharks grew so successfully that arrangements had to be made to return each shark to the wild before it outgrew the 1.2 million-gallon exhibit! Researchers also measured the white sharks’ oxygen consumption while each shark was transported to and from the Aquarium. This was both first-of-its-kind, but also filled a knowledge gap that field studies alone could not have provided. What we learned from studying white sharks in captivity inspired and informed future conservation efforts in the wild. 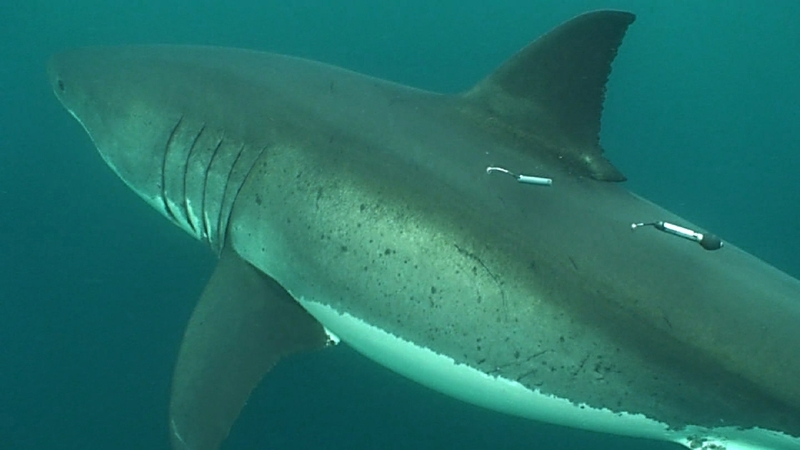 Using external data tags on white sharks gives the Aquarium research team new insights about shark migrations. White sharks make annual migrations of up to 4,000 km (2,485 miles) each way – but how do these animals fuel their travels? By comparing buoyancy and body condition data gathered from one of the young white sharks exhibited at the Aquarium, researchers then assessed the energy storage and usage in migrant wild white sharks – a major accomplishment marking the first time such a comparison was made. Because sharks store oils in their large livers, the more food they eat the larger their livers grow, and the more buoyant they become. 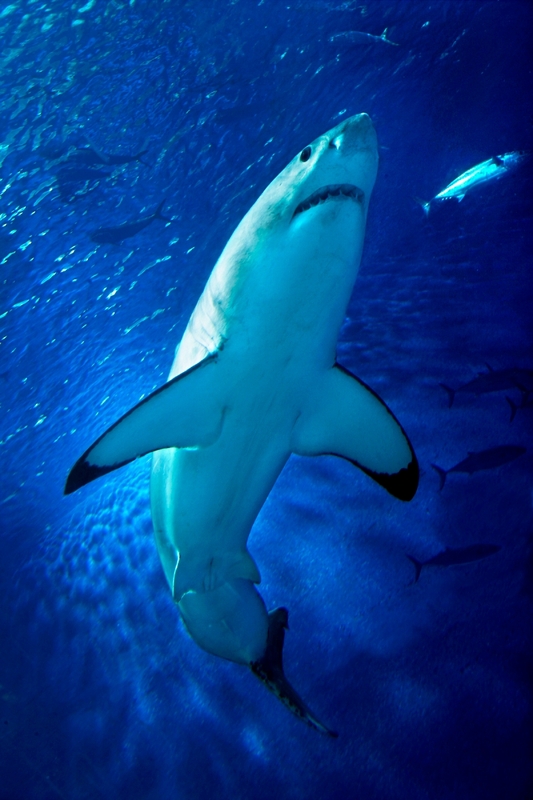 An adult white shark’s liver can account for 25 percent of its body weight. So, researchers examined data gathered from migrating white sharks tagged with depth recorders to determine changes in buoyancy and, in turn, estimate fat depletion during their epic Eastern Pacific migrations. They learned that as the sharks traveled non-stop for up to 30 days and halfway across the Pacific, they tapped their energy stores – as evidenced by a gradual decrease in their buoyancy. Sea otters, sharks and bluefin tuna aren’t the only ocean animals Aquarium scientists study and work to protect. To learn more about the full scope of the Aquarium’s conservation research program, check out our list of scientific publications spanning nearly 30 years. To take part in a March for Science, find a march near you. March for Science signs that you can download and print!